Since 2016 it was detected that more than 60% of customers had changed their expectations and requested a better service. According to Forrester, 72% of companies state that improving the customer experience is their highest priority. Other studies also highlight companies are losing more than $ 62 billion due to poor customer service, no one can afford this and want to survive or grow in such a competitive market. Moreover, customer service is no longer just a support and service system, it is also part of the new marketing, but it is also the basis for the viability of any company, with customer retention being the key to profitability. But you have to be very attentive, the client's expectations are changing (millennials, omnichannel) and the technology is evolving to be more specialized each day, this puts customer service in a crucial position for success, but also makes it more and more complex and diverse. Many organizations and companies are already underway evolving towards this new model, implementing new structures, methods and relying on new technologies, but all this takes time and even a cultural change that if not done quickly and on time, can make companies lose relevance, competitiveness or even disappear from the market. I said it before, more than 60% of customers have changed their expectations and request a different way of being served, one of the main groups within this new ‘concept’ of customers are the Millennials; for their large number, for their purchasing power, and for the exquisite of their expectations. Brand commitment goes both ways. Millennials have a different link with the companies and brands with which they relate. They tend to interact more closely with them and often also share their experiences to even make a purchase or a decision based on the joint review or opinions of other people. This implies that those Millennials who have a good customer experience share it and can become brand ambassadors but, on the contrary, those who feel dissatisfied will have no qualms about leaving the mark or worse in sharing that disappointment with others. They are therefore our ‘digital reputation’ and it is also a challenge to maintain. Self-service or self-assistance does not mean a depersonalization of the service and less distancing from the client. More than half of the Millennials feel comfortable and even want to solve their Customer Service problems autonomously, this type of profile is much better informed and they are also more ingenious than their predecessors, they demonstrate a different attitude towards the traditional channel of support/telephone service, that's why it is more important than ever to provide quality self-service resources for your clients. Provide a hybrid support model. It is important to keep self-service resources available throughout the day, this will reduce friction with other channels and relieve pressure from online channels, it is even important to have FAQ capabilities and/or proactive training to clients, but always a global and hybrid way and without canceling traditional channels like the telephone for less standard or more critical situations. Key points and trends of the new CX model, evolve or DIE. At this point of reading I think that many of us agree that the concept of Customer Service is a key aspect in this new world of Millennials, digital transformation, and industry 4.0, but logically there are many organizations that have already reacted and are putting into practice new customer-centric models and applying new technologies that serve to capture, improve the experience and retain these customers, I do not want to end this article without talking about some of them and help those who have not yet started or who are starting in it . Value and experience first, then the price. Even low-cost companies take this into account, the value proposition of a good Customer Service can even make the price for the customer less relevant. Technology allows us to achieve this in a much easier way, we know the preferences, it’s history, it’s trends and we can treat and value them in a surprisingly immediate way, making a big difference with it. Artificial Intelligence (AI) to improve attendance and experience. The ability of new devices (and not just computers) to interact with human beings is stronger than ever. AI will help us to make better decisions in each contact and positively impact on the client. AI does not have to replace the interaction with a human being but serve as one of the best assistants. Related to the previous point (AI) that improve the online conversations of text that we have with the Customer Service centers, the best chatbots are no longer only able to answer requests or questions, but even recognize when a client does not feel satisfied or he is confused and redirect his attention to an agenda for online assistance. We can consider today IoT already quite extended, elevators with signaling faults to its technicians, vending machines that record peaks of activity during the day, etc., but IoT is expected to grow dramatically, by 2020, customers will have an average of twenty connected devices, this is an excellent opportunity for a proactive Customer Service. But it is also an excellent source of information and observation of the habits of use and consumption and with it a source of innumerable commercial opportunities. But the evolution of this technology is even more ambitious because in the near future the devices can even interact in them and go from the IoT to the Internet of the WHOLE. Technology applications and RPA solutions will help standardize the delivery of services. RPA software robots perform routine business processes that do not require judgment and make simple decisions by mimicking the way agents interact with applications through a user interface. Companies can automate complete end-to-end processes, leaving only exceptions for dealing with online or field agents. Greater focus on ‘Customer Success’, key to better Customer Service. I do not want to say that this is a new concept when putting it on this list of trends, but I do think it is important to talk about it in this new scenario, in this case it is important to recognize that those products that are less successful at the client level or with a higher level of frustration in the experience are those that logically will make a more extreme use of the Customer Service and therefore the conclusion would be that the new programs of ‘Customer Success’ should be focused on this will eliminate frustration and also reduce calls and access to the resources of the Customer Service or better, will guide them to valuable elements that will make the client's retention go up. The Customer Service becomes proactive. 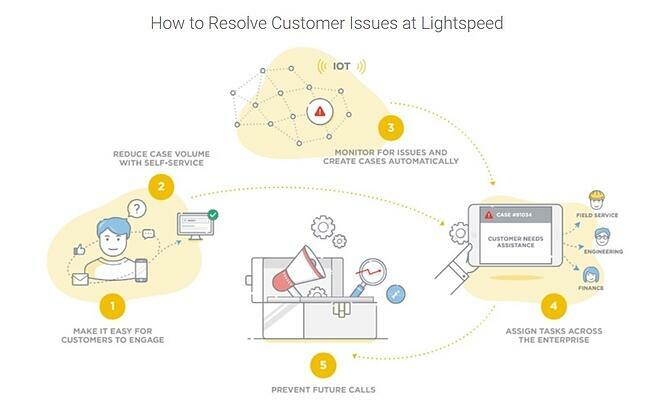 Related in part with the previous point and relying on technologies mentioned above (IoT), the Customer Service are already applying early detection of problems and applying solutions even in some remote case without the client noticing or complaining. A good program of proactive Customer Service generates a high level of trust. Speed as another key point. Recent studies tell us that support services are increasingly responding faster, for example, the response times of questions to emails are reducing their average to even less than 7 hours, that company that responds well and quickly will stand out and win more customers. The ‘Field service’ becomes the face of your company. These interactions with the client are by far the most personal channel and can or cannot break a customer relationship. Since last 2017, a clear improvement strategy has been started in this field with technologies that take advantage of the analysis for a better programming of on-site assistance, shipments, ordering tasks and work orders, assets, timesheets and service policies. Even with augmented reality (AR) technologies, it superimposes digital information on the physical world and helps companies spread that knowledge more effectively. I have not pretended to be exact in this explanation, perhaps there are other trends or key points within these new models of Customer Service, I just wanted to express my opinion about what are the keys and trends from my point of view and in relation to the experience in the implantations and processes of transformation in which I am participating and I think that these are the points that stand out most, serve this as my reflection but also my advice on what to keep in mind for how to remain competitive and relevant to their clients .